FRAMED PRINT. 22x18 inch (56x46cm) Framed Print with Black Satin with Off-White Digital Mat. 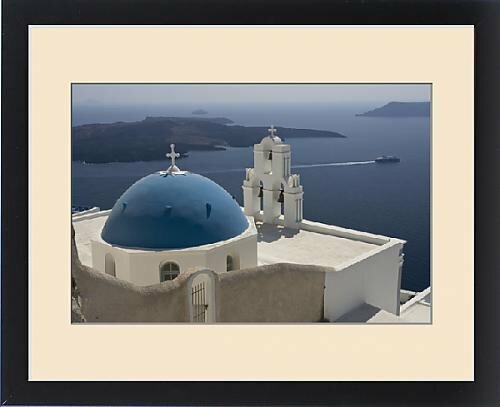 Artwork depicting Europe, Greece, Santorini. Greek Orthodox church and white bell tower overlook a. Greece, Santorini. Greek Orthodox church and white bell tower overlook a luxury yacht, Seabourn Spirit, on the Aegean Sea. Credit as Bill Young / Jaynes Gallery / DanitaDelimont . Professionally made to order in the USA. Artwork Description... Greece, Santorini. Greek Orthodox church and white bell tower overlook a luxury yacht, Seabourn Spirit, on the Aegean Sea. Credit as Bill Young / Jaynes Gallery / DanitaDelimont.com.